Iloca cameras were produced from 1950 to 1959 by Wilhelm Witt of Hamburg. 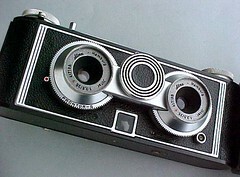 Early models were the Iloca I, Ia, II and IIa, which were small and relatively simple viewfinder and rangefinder cameras. The "Quick" series introduced automatic cocking of the shutter when winding the film. The name "Rapid" came from the adoption of a rapid winding lever. The cameras were sold very successful in the 1950s through the Sears mail order catalogue in the USA. However, the company was probably best known for their range of stereo cameras. Their main claim to fame was the introduction of the first 35mm camera with an integrated electric motor wind. Unfortunately it was very expensive and sold poorly in Europe. It was much more successful in the USA where it was sold as the Graphic 35 Electric. The company was acquired by Agfa around 1960 and the Iloca Electric was re-introduced as the Agfa Selecta m - only this time with a fixed f2.8 Solinar lens in place of the interchangeable bayonet mount. This page was last edited on 18 February 2018, at 15:15.